Steve and I have been accused of going overboard with the food when we entertain. Just like the Christmas gift pile that keeps on growing in December, we worry that we won’t have enough so we prepare more, and more, and more, until the table is straining under all the food presented. Whatever doesn’t get eaten gets reworked as leftovers, and our anxiety that someone might go home hungry is kept at bay. When we prepared for our first summer cookout of the year, we didn’t buck the trend. Our menu was long to accommodate the tastes of the adults and kids in attendance. Our big ticket item were these beautifully marbled rib eye steaks that we crusted with a zesty salt blend. On a whim, we decided to also grill up some skirt steak, our favorite cut of meat, but a much less fancy one than the expensive rib eyes. 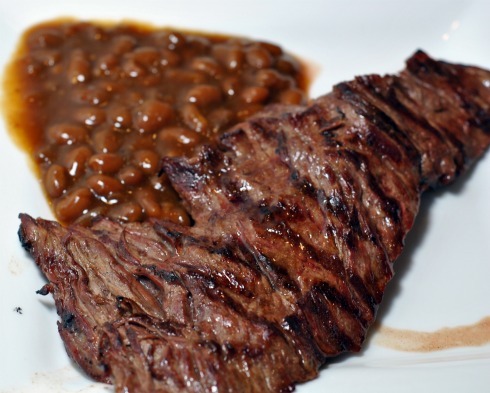 We had no idea the inexpensive skirt steak would be the biggest hit of the barbecue! 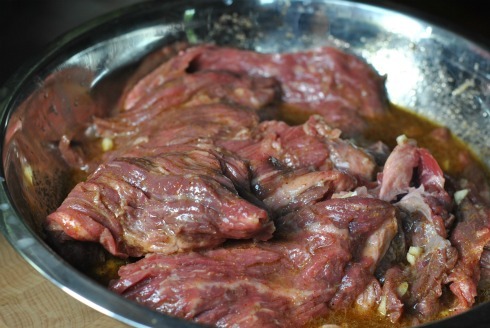 We marinated the skirt steak in lime juice and a cumin heavy spice mixture. We thought we were taking a chance with this exotic spice mix, but our guests could not get enough of it. They loved the fresh and tangy taste of the marinade and thought it paired well with the great texture of skirt steak. Although the flavor was exotic, it was well complemented by the grilling beans provided by Bush’s for our event, as well as the roasted fingerling potatoes and our fresh tomato and cucumber salad. Everyone asked for the recipe. Cut the skirt steak into individual pieces, about 6 inches long. In a large bowl, juice the limes. Add the olive oil, diced garlic, and spices. Whisk until well blended. Add the skirt steak and move each piece around to coat with the marinade. Marinade in the fridge for 30 to 45 minutes. Grill on direct heat, medium-high flame, 3-4 minutes on each side. Skirt steak is best at medium rare. Resist the urge to peek at your grill marks, just flip it once and you’ll have a beautiful looking steak. Let rest for 5 minute before serving to let the juices redistribute. As I’ve disclosed in earlier posts about this barbecue, I have received compensation from Bush’s Grillin’ Beans to host this event. I also received the Grillin’ Beans to serve as well as a great assortment of grilling utensils and beautiful Emile Henry pan. 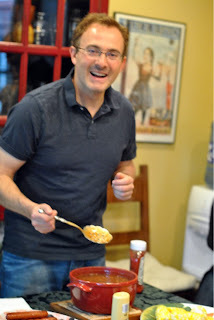 I’m giving away the same grilling set as well as an assortment of Bush’s Grillin’ beans. You have a few more days to enter the Bush’s Grillin’ Beans Giveaway to win this gorgeous prize pack worth $300. >my husband would love this! so great to meet you at BHFood! >I love skirt steak! No one uses it like they should. It's 9am where I'm reading, and I want a skirt steak and eggs now. Thank you for inspiring my belly. >I adore cumin! We will definitely be trying this!